← Should my 13 Year Old have Instagram? These were delicious! We made them this morning. We used coconut oil and didn’t miss the honey at all… My crew took down the whole batch in no time! Jim and I managed to sneak a few bites when the kids weren’t looking, and we loved them, too. Thanks! awesome!! thanks for the feedback! we ate them too this morning. Eric is always happy to have them on hand too, because he uses them as “bread” ha. Way to freaking dry for a batter. 1 tbsp of water? Are you sure? My batter was like slightly damp sand. ouch! But thanks for the feedback. I will let Heather speak to this one, but have you done much baking with almond flour? The “batter” is nothing like the runny, glutinous consistency of conventional pancake batter. You can always add more water (or coconut milk!!) if your batter is a little off. -Ensure to add the Tbsp of melted butter/coconut oil to the batter, and then use additional to coat the griddle pan. I’m not sure that this was clear in my write up. -Make sure your banana is very well mashed almost to the point of a thick liquid. I like to use a mini chopper. -If your banana is small, use two. -Brand of almond flour. I am a huge fan of JK Gourmet blanched almond flour. I’ve found that other brands (particularly Bobs Red Mill) yield very inconsistent results. -Add a tsp of extra water or unsweetened coconut milk at a time if the batter is still too dry. Again, thanks for the feedback. Let us know if they turn out better for you next time! Hmmmm…..I wonder if this would work with pumkin in place of the banana? I’ll be the guinea pig! I bet they would! I might just have to try that tomorrow! Add some pumpkin pie spice, and vanilla extract and I bet they’d be perfect. Let us know how they turn out for you! Ever make these to freeze for later use?? Yes, I often freeze leftovers and re-heat in either microwave or toaster oven. These are epic! So yummy. How many do these yield? Shame if I made too many, and leftovers got thrown out. 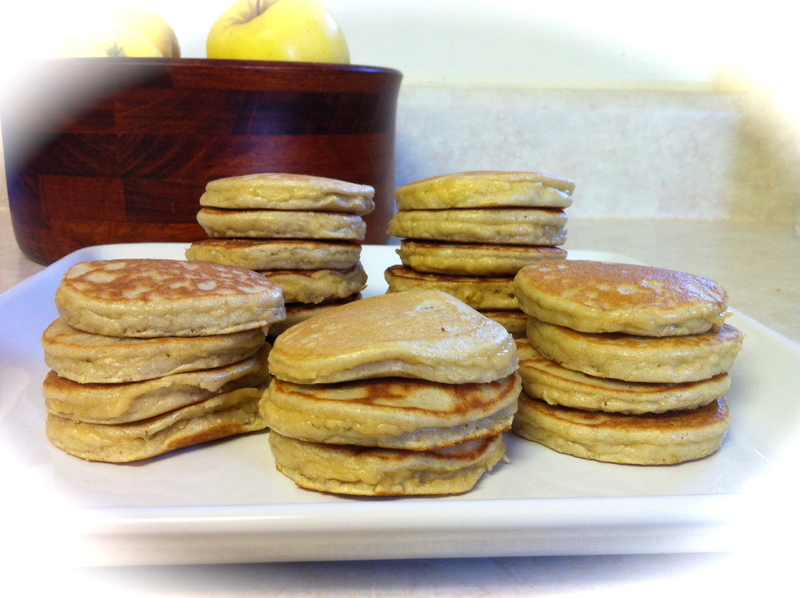 The recipe makes about 20-25 mini pancakes. As for leftovers, they can be frozen and re-heated. Enjoy! Absolutely loved these! I added scoop of protein powder (blue bonnet vanilla) and they turned out great. Cold leftovers are excellent for lunch box the next day…..!